One of the most common questions we are asked at Wise Property Care is “What is the difference between wet and dry rot?” Both conditions affect timber and they are both associated with aggressive fungal decay. However, the main difference between the two is that Dry Rot (Serpula Lacrymans) will generally germinate and grow on timbers with a lower moisture content (upwards of 20%) than that preferred by Wet Rot (upwards of 50%). The visible fungal growth is, however, distinctly different as you will see in the photographs on this site with Dry Rot generally a White mycelia growth with patches of yellow and brown coloured fruiting bodies. With Wet Rot (Coniophora Puteana) the mycelia is usually more black/brown in colour (in certain situations it can be white, for example under linoleum) with the fruiting bodies tending to be more white/grey in colour. There are over 20 species (in the Coniophoraceae family) of types of Wet Rot fungus and we have generalised here describing the most common, Coniophora Puteana. How does wet rot grow? Wet rot tends to develop on permeable surfaces, usually timber, where there is a moisture content of at least 50%. 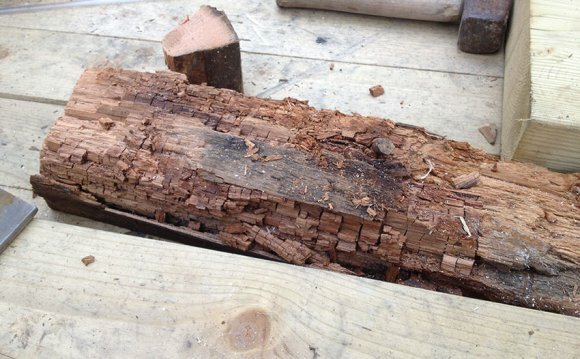 If wet rot it is left to grow, unimpeded by wet rot treatment, it can weaken timber. This will often lead to structural damage. Moisture content this high is usually a consequence of malfunctioning external water management systems such as plumbing, gutters, downpipes or stone pointing. If you spot a faulty pipe, then it is worth checking your property to make certain there are no signs of wet rot growth. Fortunately, wet rot does not spread through masonry and the growth of wet rot will cease when the moisture is removed. Although the name “dry rot” suggests that no moisture is required at all, it actually requires moisture level of around 20% to grow. An important difference between dry rot and wet rot is that dry rot will often remain hidden in areas of the property that cannot be seen, such as behind walls or underneath floorboards. Unfortunately, this means dry rot can cause considerable damage before it is identified. Areas with poor ventilation, and therefore a higher-than-normal humidity, are often susceptible to dry rot. If you have condensation on your windows it could be an early warning sign of dry rot. If you think your property could be affected by either of these conditions find out more on our specific wet rot and dry rot pages. Find out more about this property problem caused by high moisture levels. Get the facts from the experts at Wise. Dry rot is one of the more servere contidions a property can face. It is treatable though. Find out more from our expert team. If you want to speak to someone regarding wet rot or dry rot in your property, call Wise Property Care on 0800 65 22 678. You can also get in contact online using our online contact form.